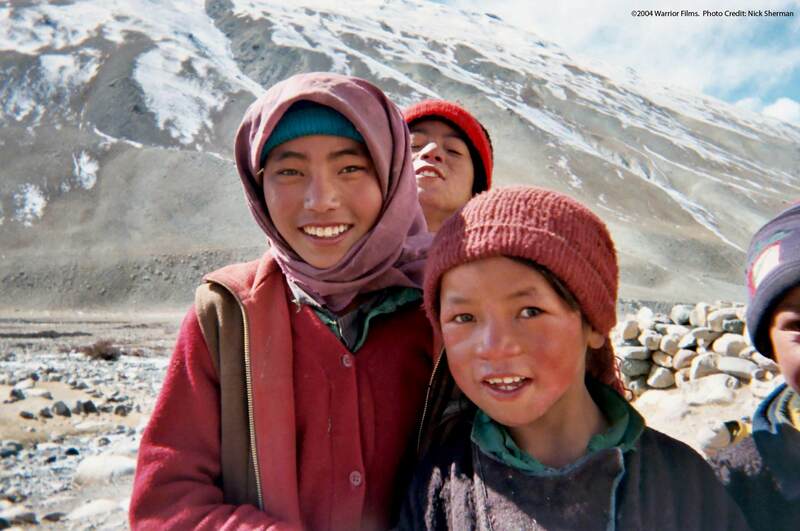 When Sally Heath saw her first set of Matroyshkya dolls in a Santa Rosa gift shop in the early 1990’s, a hobby was born. Heath, a retired SRJC Physics instructor, and long-time Santa Rosa resident, now has 121 sets of these charming wooden nested dolls and 117 of these are on display in the Connie Mahoney Reading Room at the Mahoney Library on SRJC’s Petaluma campus. Matryoshka are most often made of wood from trees of the genus tilia. Species of genus tilia are commonly known as linden wood or lime wood (not the citrus lime tree) and as basswood in the United States. The small solid figure in the center of the nest of dolls is first turned on a lathe. The bottom half of the next larger doll is turned so the center doll rests inside it and then the top half of that doll is turned to fit on the bottom half. This bottom and top turning process is continued until all the layers are completed. 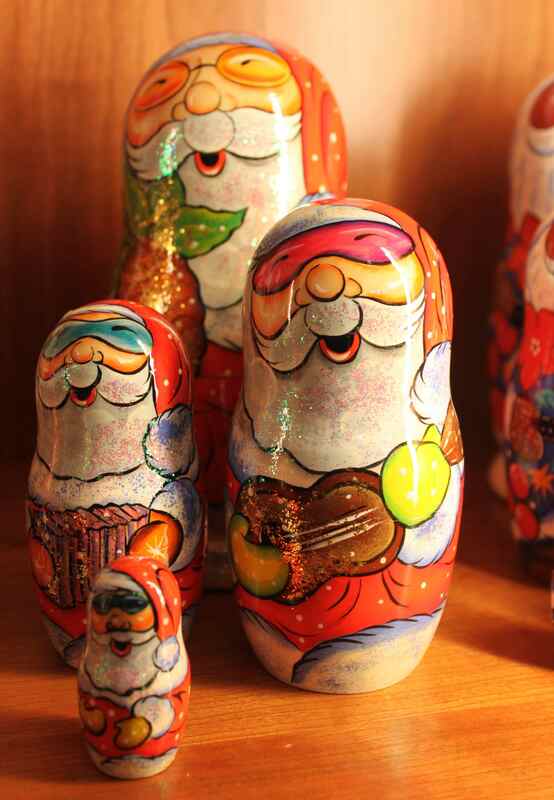 Matryoshka are considered folk-art, kitsch and camp and come in at all price and quality points. When Sally Heath first started collecting in the early 1990’s, the only dolls that she could find locally were from China and were sold under a label called “Authentic Models” and came in a box with a plastic cover. She encountered her first Russian-made matroyshkya couple of years later in a Christmas Shop in Santa Fe and immediately recognized their superior workmanship and fine painting detail. 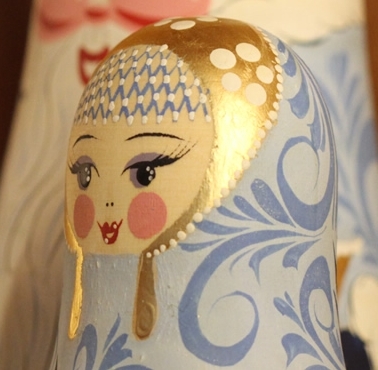 From that point on, she has collected mainly Russian-made matryoshka. The display in the Connie Mahoney Reading Room occupies 6 cabinets. The first and second (left most) cabinets contain Russian-made matryoshka, including Heath’s largest set which contains 15 hand-painted dolls. The largest doll in this set is about 10 inches tall while the smallest is about the size of a peanut and skillfully painted. 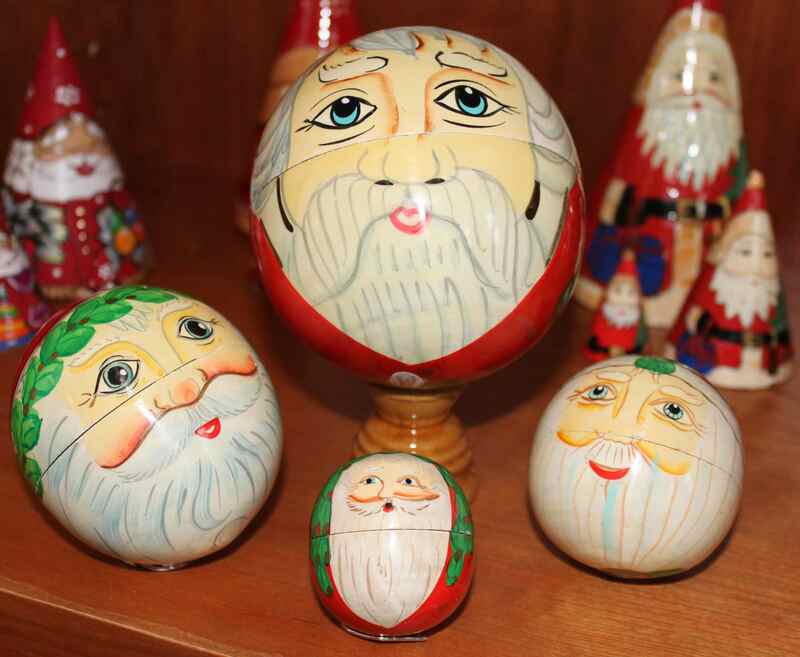 Many of the “Santa” figures in the display are not Santa Claus but rather “Ded Moroz” or Grandfather Frost, who serves as the Russian equivalent of our Santa Claus. Grandfather Frost leaves presents for children on the New Year Tree. Unlike Santa Claus, he doesn’t travel down chimneys and does not drive a sleigh pulled by reindeer. He enters houses through front doors and either drives a troika or walks with a long magical staff. Ded Moroz is commonly accompanied by Snegurochka, or Snow Maiden, his granddaughter, who helps him deliver his toys and treats. Snegurochka’s name is derived from the Russian word for snow, sneg. She is most commonly depicted with blond hair and wearing a long silver-blue robe and a furry cap. 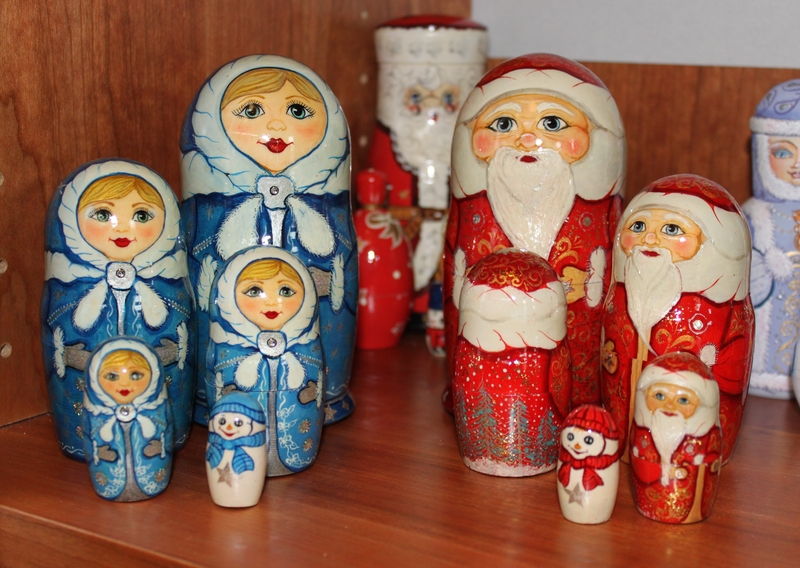 The upper shelves of the third cabinet and forth cabinets contain Russian-made Ded Moroz and Snegurochka. Below these are some uncommonly shaped sets of dolls, including some round, oval and sharply pointed sets. A number of these open at the bottom rather than in the middle. 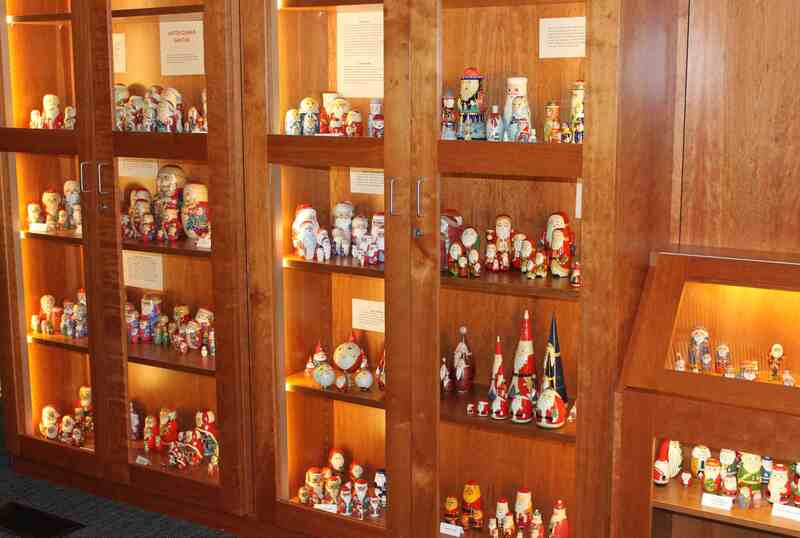 The last two smaller cabinets contain nested dolls from different countries, including a set of three Limoges porcelain Santa dolls which don’t really nest and each has a hinged opening at Santa’s belt. Heath says this set has doubled in price since she bought it. The Connie Mahoney Reading Room is located inside the Mahoney Library on Santa Rosa Junior College’s Petaluma Campus, 680 Sonoma Mountain Parkway, Petaluma, CA, 94954. Parking on campus is $4.00 and is by permit only and the machine requires exact change. Hours: 8 a.m. to 9 p.m. Monday through Thursday, and 9 a.m. to 1 PM Friday. Phone (707) 778-3974. The library will close for the holiday/semester break on Friday, December 17th, at 1 p.m.